LOS ANGELES — Hoping to make San Pedro a waterfront destination similar to Santa Monica or Newport Beach, which draws large crowds, two Los Angeles councilmen have advocated for the Ports O’Call redevelopment to be grander and more ambitious than what was recommended in a recently published feasibility report. The Port of Los Angeles released a Financial Feasibility Report for Ports O’Call redevelopment in November 2014 and recommended the city pursue a project almost half the size of what was initially conceived by civic leaders and the designated developer. Specifically, it was hoped San Pedro’s redeveloped waterfront – commonly referred to as the L.A. Waterfront – would ultimately feature a large scale attraction occupying a venue about 100,000 square feet in size and multiple dining, entertainment and retail destinations filling in another 200,000 square feet of space. However, the Ports O’Call study suggested it would be most feasible for the port to pursue a medium-scaled redevelopment plan with about 150,000 square feet of dining, entertainment and retail options as well as a themed attraction anchor tenant occupying a 50,000-square-foot venue. Councilman Joe Buscaino, who represents San Pedro on the Los Angeles City Council, said a pared-down vision of how the L.A. Waterfront should be developed is not an option. Councilman Mike Bonin, who sits with Buscaino on the city’s Trade, Commerce and Tourism committee and represents Los Angeles’ other waterfront communities in Venice and Pacific Palisades, agreed. How large of a scale the L.A. Waterfront redevelopment actually becomes remains to be seen, though Gene Seroka, the port’s executive director, said revitalizing Ports O’Call and the surrounding area is “of the highest priority” to the Harbor Department. “There is a huge opportunity to increase spending from outside the area, [but] we have a less dense population surrounding us. We have a very strong market base right now; we need to build on top of that with different things,” said Mike Galvin, director of special projects at the Port of Los Angeles. A 400-acre waterfront, city officials hope to redevelop the San Pedro area into a “vibrant, world-class” destination. In addition to redeveloping the 30-acre Ports O’Call area near downtown San Pedro, the L.A. Waterfront also includes neighboring Wilmington in its plans. If fully realized, a redeveloped L.A. Waterfront could, according to city officials, support up to 300,000 square feet of visitor-serving commercial use and another 75,000 square feet for a conference center. The restaurant, retail and office space currently occupying space at the L.A. Waterfront takes up about 135,000 square feet of built area. According to the feasibility report, existing tenant leases expired at the end of 2014. The feasibility report also stated current visitor-serving tenants grossed, on average, between $26 million and $28 million from 2008 to 2011. For 2012 and 2013, the estimated gross sales for visitor-serving tenants jumped to an average of $34 million, according to the feasibility report. When all is said and done, the redevelopment project aims to link downtown San Pedro to the waterfront, enhance commercial opportunities at the waterfront, move cargo handling operations away from high visitor traffic areas, keep up with the growing cruise industry and find ways to ensure the waterfront is easy to get to and stay. Accordingly, the report proposed a general concept of how a redeveloped L.A. Waterfront could look like, with characteristics such as a “generally indoor orientation” somewhere between 30,000 and 120,000 square feet in size and housing an internationally-known brand. The final concept would be “unique in the Los Angeles market” and balance commercial, educational and entertainment options. According to the feasibility report, popular events already operating at the Ports O’Call include World Trade Week free boat tours, Lobster Festival, Tall Ships Festival, Navy Days, Happy Harbor Halloween, movie nights and concerts. The feasibility report stated other elements that could help the L.A. Waterfront draw more visitors included a for-profit indoor entertainment attraction or a local outdoor theme park. If Los Angeles pursued the plans suggested in the feasibility report, the estimated economic impact would be 850 full-time-equivalent jobs created and tax revenues of $87 million, both more than double than current levels. At a Trade, Commerce and Tourism Committee meeting Dec. 9, a legislative analyst with the city said because there are so many options for residents and visitors in the entire Los Angeles region to spend their respective dollars, both the council and port officials should be cautious of building something that either lacks authenticity or would have a high vacancy rate. The committee will receive an updated status report on the L.A. Waterfront project on Jan. 13. Home to many uses, the Port of Los Angeles provided slips to more than 4,000 recreational and commercial vessels. 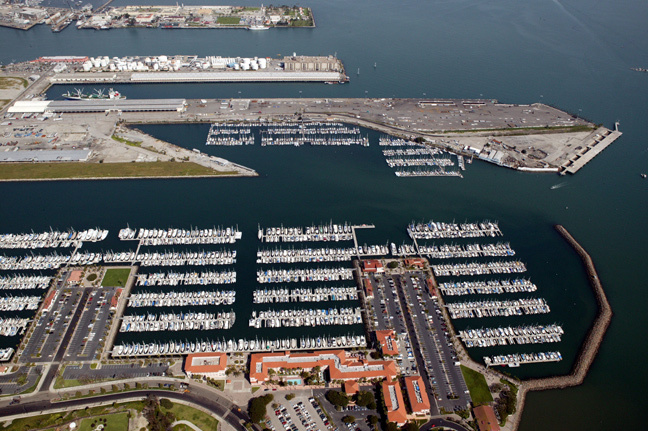 Key marine developments at the port include L.A. Harbor Sport Fishing and Cabrillo Marina. Other common activities at the waterfront include harbor tours, dinner cruises and whale watching excursions. The Harbor Department issued a Request for Qualifications in July 2012 to seek out a developer for the proposed redevelopment project. Three months later, The Ratkovich Company and Jerico Development were unanimously selected as the developer.